Yesterday I wore my favorite store-bought sweater. It’s my favorite because, first of all, it’s a henley-style pullover and I find those very comfortable. And it’s a silk / mohair / wool blend, so it’s very warm but light-weight. And it’s bright rainbow stripes separated by black stripes. So, while colorful it’s not obnoxious. And when I bought it, it was on close-out, and marked down, and then put in the final sale rack, and I had a coupon. So a $120 sweater cost me $15. I should have bought two of them. But I digress. Yesterday I wore my favorite store-bought sweater. As I waited for the elevator, one of my colleagues said to me, That’s a very bright sweater! It’s nice on a gray day like today. I thanked him, and he continued, With all those colors, you could wear those with any socks and shoes you wanted! Then he looked at my feet. Oh, he said, you did! 😆 We both chuckled all the way down in the elevator. 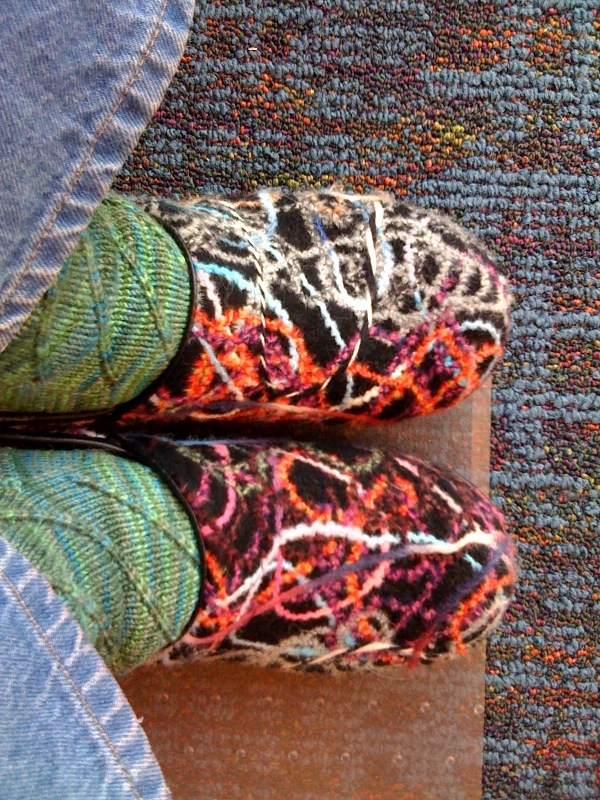 Did I tell you I also love my Danskos? A very happy holidy to you, gentle reader! I hope that you are warm and safe and have your loved ones tucked in around you. I wish you peace and joy and yarny goodness. 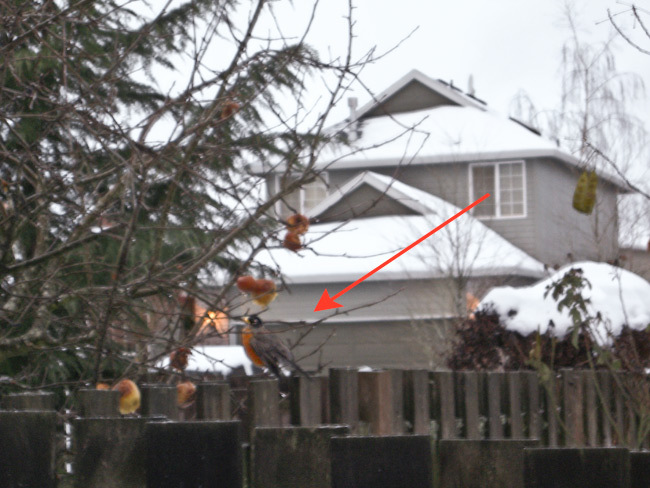 Do you see the little robin perched on my neighbor’s back fence? 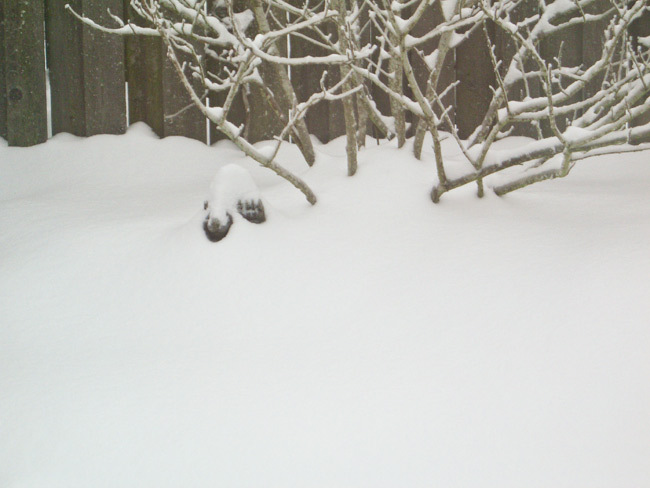 This little guy discovered the Asian pear tree when the snow first started falling. Having found what must seem like a 5-start robin restaurant, he has been guarding it from all comers, and apparently even sleeping next to it. I have watched him stand off a whole little flock of robins and other birds that had designs on his tree. At one point I heard a loud chatter and scolding and peaked out the back door to see a very surprised looking falcon perched on the fence post. I doubt that the falcon wanted Asia pears, but I’m surprised he didn’t take the robin. I love this little guy’s feistiness and attitude. 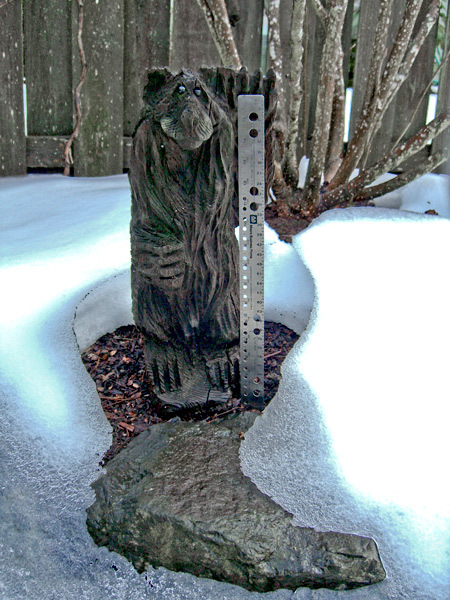 It will be interesting to see if he sticks around once the snow thaws – which should be soon! #1 Son: [without preamble] I need to go buy chains right after work today. Some scary $#! * happened on the way over here. #1 Son: Yes, I’m fine. But it was really scary $#! * – really scary! Mom: I worry about you driving over the bridges. #1 Son: The bridges were fine. No problem across the bridge. But Hawthorne is really sketch. Really scary. I’m still sort of stressed out. But slow and steady wins the race and all that. But I think I really need to get chains. Mom: I agree! Chains would be a very good thing! Call first before you go to the store to make sure they have them in stock. #1 Son: Good point. Did you know that they’ve declared a state of emergency here? Mom: Yes. It’s pretty dicey out here, too. The roads around me haven’t been plowed and it’s really bad. I don’t want you coming up here if it’s like this tomorrow. It’s not worth it, even if it is Christmas. We’ll just have Christmas later. #1 Son: You’re right. I agree. Mom [somewhat surprised by #1 Son’s ready agreement not to come on Christmas after several previous conversations where horrible driving conditions were dismissed as not really that bad]: How about New Year’s? Are you off that day? We can just have Christmas on New Years! #1 Son: Good idea! That sounds good. I’ll let you know about the chains. Love you! RIght now as I look outside it’s raining lightly and the snow is starting to melt. But there’s so much of it, I can’t believe that it will all be melted before it starts to freeze again tonight, especially with the layers of ice. And there might be more snow tomorrow above 500 ft. For me, that means that someone somewhere will flip a coin to decide if I’m going to get snow or not. Friday we’re supposed to be back to just rain. Thank goodness. 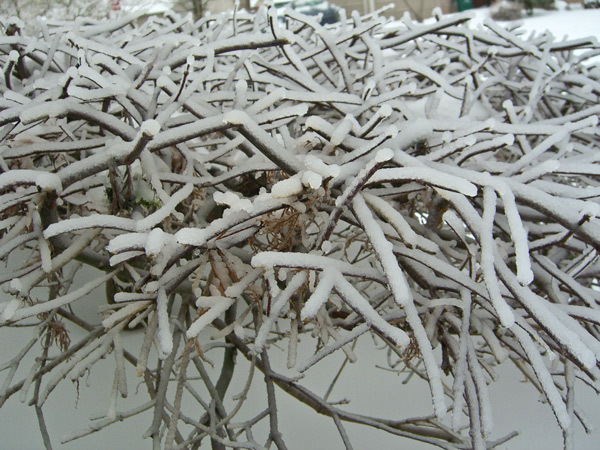 I’m not sure who ordered the record snowfall for a white Christmas here in Portland. But… let’s not do this again, eh? First, before we get to the knitty gritty (haha), here is the obligatory snow update. 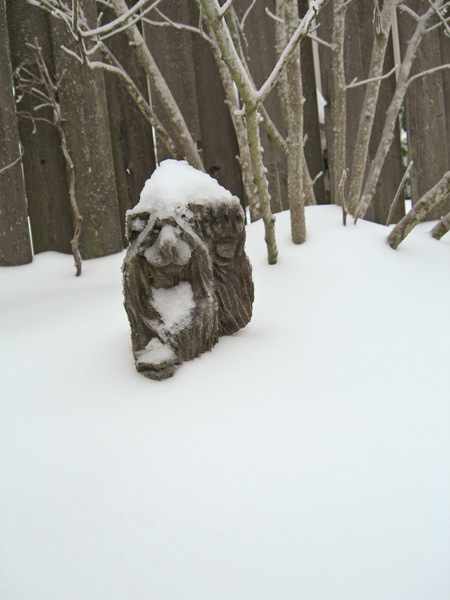 Yes, I know gentle reader… snow… ick. But I have been living this for the last week, so work with me here. Thank you to everyone who entered! It was lots of fun. I had a blast reading your comments. I’m sort of a tool nerd. The tools picture in the contest was cobbled together from clip art, although I have a ball peen hammer that looks just like that one, and it’s my favorite hammer ever. But that also means that I don’t have these objects actually in hand to look at. I didn’t realize that the business end of the tin snips (?) was hidden by the screwdriver handle until y’all started commenting on it. So I threw that one out. Or gave it to everyone, whichever way you want to look at it. tin snips? – probably. Thrown out. bucket grinder? – your guess is as good as mine. Thrown out. There were four people who got all of them right (except for the two eliminated items). I couldn’t stand to leave one of them out, even if it would have been random and yadda yadda. 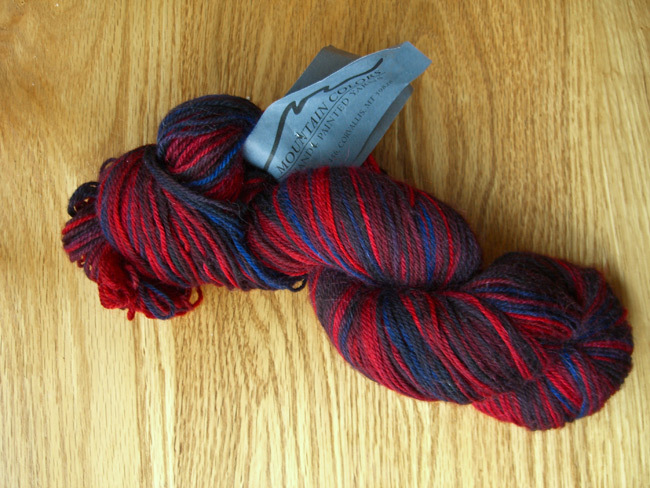 So I dug around in my stash and found this skein of Mountain Colors in Flathead Cherry, which I believe is a discontinued colorway. To choose who got what, I wrote the names on slips of paper and put them in a hat. And I listed the yarns on other slips of paper and put them in a different hat. The hats actually looked a lot like box tops because I seem to be hat challenged right now. I then closed my eyes and picked a slip from both hats as a pair. I didn’t look at who got what until I had picked all four pairs. The winners have been emailed, and their yarn will be winging its way to them just as soon as I can get unburied enough to mail it out.